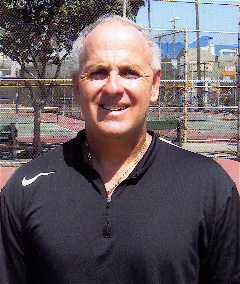 Sol Hauptman won his first national Paddle Tennis title at age 17, and owned the men’s National Doubles championship 28 consecutive years. He won his titles with five different partners, Jeff Fleitman, Rick Beckendorf, Scott Freedman, Marvin Silver and Doug Koker. Hauptman is an 18-time National Beach Champion, teaming with Jeff Fleitman, Scott Freedman and Russ Garber. He won the National Mixed Doubles twice, with Ingrid Wohlers, and is the former U.S. Jr. Platform Tennis Champion. Sol is the only player who has won the National Men’s Championships in four decades (70s, 80s, 90s, 00s). He once won four National Men’s Doubles titles in different states during the same year (New York, Florida, California, South Carolina). The New York-born Saugus-residing Venice Beach fixture was the Pro at the Sand and Sea Club in Santa Monica from 1985 until its closing in 1991; and Pro at the California Yacht and Paddle Tennis Club.